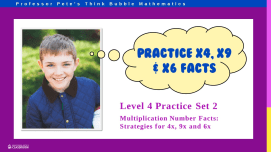 Activities to develop students' memorization of the basic multiplication facts or times tables to 12x12. Teacher notes: The importance of teaching factors and multiples. How to find if a number is a multiple of 2 or 4 in large numbers, revision of doubling and halving large numbers. How to find if a number is a multiple of 5 or 10 in large numbers, revision of various extended number facts. How to find if a number is a multiple of 3 or 9 in large numbers, revision of various extended number facts and division with remainders. Listing all the factors of a given number, revision of various number facts. Finding the LCM of two numbers, revision of various number facts and division with remainders. Finding the GCF of two numbers, revision of various number facts and division with remainders. Drawing factor trees for numbers, revision of various number facts and division with remainders. Revision of all factors and multiples, including finding LCM and GCF, and factor trees. Set of 5 assessment tests to check on how students are progressing with each of the units in the Factors & Multiples series of worksheets. 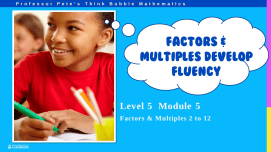 Set of 10 homework sheets to match each of the sets in the Factors & Multiples series. Contains information for parents. 4 pp. 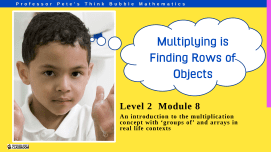 Worksheets to accompany Interactive PowerPoint Think Bubble Math 208. 4 pp. 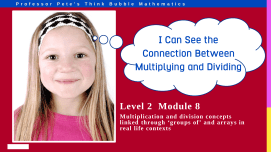 Worksheets to accompany Interactive PowerPoint Think Bubble Math 308. Pretest for times tables. Record speed and accuracy as a benchmark. Use before teaching times tables. Posttest for times tables. Record speed and accuracy by timing students and compare results after teaching times tables. Teacher notes: How to teach the times tables with strategies. Includes advice on using the system of worksheets for your students to have instant recall of all number facts. Strategies can be applied to larger numbers in the future. Advice for teachers on the “Doubling” strategy for 2x multiplication facts and 4 practice worksheets. Advice for teachers on the “Place value” strategy for 5x, 10x multiplication facts and 4 practice worksheets. 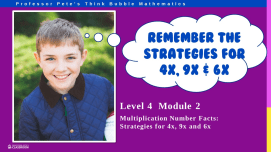 Advice for teachers on the “Doubles plus one more set” strategy for 3x multiplication facts and 4 practice worksheets. Advice for teachers on the “Double double” strategy for 4x multiplication facts and 4 practice worksheets. Advice for teachers on the “Special case” strategy for 0x and square numbers multiplication facts and 4 practice worksheets. 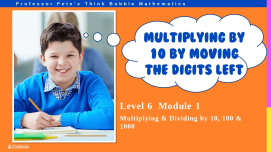 Multiplication tables worksheets, focusing on special cases: 0x, 11x and square numbers. Advice for teachers on the “Tens less one set” strategy for 9x multiplication facts and 4 practice worksheets. Advice for teachers on the “Build from 5x or double 3x” strategy for 6x multiplication facts and 4 practice worksheets. Double double double strategy for 8x multiplication facts and 4 practice worksheets. Advice for teachers on the “Build from known facts” strategy for 7x multiplication facts and 4 practice worksheets. Advice for teachers on the “12 is 10x + 2x” strategy for 12x multiplication facts and 4 practice worksheets. Revises all multiplication facts. Record students’ times and scores to see improvement of speed and accuracy. Set of 5 assessment tests to check on how students are progressing with each of the units in the Multiplication Facts series of worksheets. 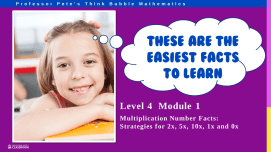 Set of 10 homework sheets to match each of the sets in the Multiplication Facts series. Contains information for parents. Spreadsheet to enter an individual student’s results. Automatically displays a graph showing the student’s progress. Board game and cards ready to print, cut out and laminate. Reinforces already learned multiplication facts. A4-sized posters: All the strategies needed to aid instant recall and ways to work out a forgotten fact. Poster ready to print out and laminate. Strategies can be applied to larger numbers in the future. A3-sized posters: All the strategies needed to aid instant recall and ways to work out a forgotten fact. Large poster ready to print out and laminate. Strategies can be applied to larger numbers in the future. A5-sized posters: All the strategies needed to aid instant recall and ways to work out a forgotten fact. Small posters ready to print out and laminate. Can be stored in students’ desks. Strategies can be applied to larger numbers in the future. Deck of Cards: The 4 “suits” are made up of the x, ÷ facts and their turnaround facts. E.g. 6×8; 8×6; 48÷6; 48÷8. Play any regular card game with this deck. For up to 6 players. Board game with a set of cards with multiplication tables on them. For up to 4 players. Page reinforces multiplication facts with a fun colouring-in page.